I'm not one to purchase expensive mascaras, because I honestly feel like a drug store mascara will work just the same. Or maybe it's because I don't have a care in the world about my lashes, so I'm fine with spending a little less on mascara, and a little more on other make up items. I've always loved the Maybelline The Falsies mascaras, so I thought to myself, I might as well try out this one. What intrigued me most about this one was the wand. 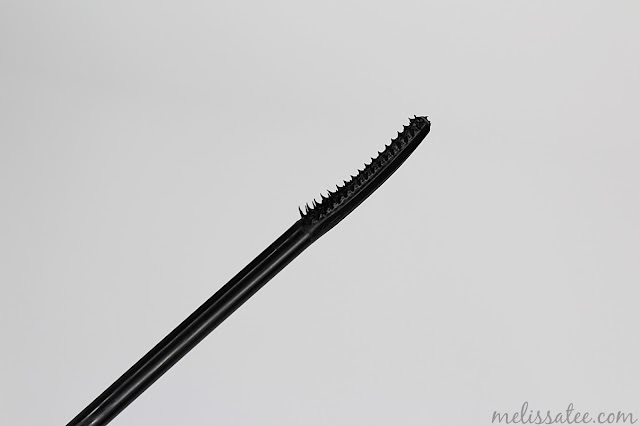 I've been looking for smaller wands lately, especially to help lift my inner lashes. It claims to help plump and lift your lashes from the roots, and develops a voluminous winged arch. My lashes are practically non-existent. I could use all the lift I could get. Honestly, it's pretty good. I get the whole winged outwards thing now and why it's called push up angel. It flares my lashes outwards quite nicely. I'm also impressed with how much longer and fuller my lashes look. You'd think it was a fiber mascara. Overall I'm quite impressed with this mascara, but then again I've always loved Maybelline mascaras. Would I repurchase? It's great, but I feel like I'm not the type to repurchase mascaras. It's one of those makeup products that I'll probably never find a holy grail.